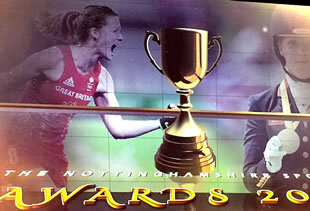 Last night Helen Richardson Walsh was awarded the Nottinghamshire Sports Person of the Year. Bob and I were asked by Helen to collect it for her, which we did with great pride. Helen is a remarkable person and a great hockey player. She returned from serious injury in 2014 - 15 to win Gold in Rio, but that is just the tip of the iceberg. Here are a few numbers - in case you aren't convinced - Youngest GB player to play in the Olympics (2000 in Sydney aged 18). 293 International caps, 45 International goals, shortlisted in 2010 for International Player of the Year, representing GB in 4 Olympic games, British Olympic Association Athlete of the Year 2009. And some colours - 2010 World Cup Bronze, 2011 EuroHockey Championship Bronze, 2012 Champions Trophy Silver, 2012 Olympic Games Bronze, 2013 World League Bronze, 2013 EuroHockey Championship Silver, 2015 EuroHockey Championship Gold, 2015 World League Gold, 2016 Olympic Games Gold. In my mind one of the greatest British athletes of all time.